Men's Corner: This is the largest cat in the world!!! Big cats have always been impressing the human race because of its size, but we are presenting the largest cat in the world that is not a tiger. This is LIGER, a mixture of male lion and female tiger. Since this type of cat created by mixing a lion and a tiger, this has led to the fact that the proportion of these cats are really a amazing. The biggest liger is a male that has a name that describes him very well, he is called Hercules. Hercules weighs 410 kilograms (904 lb), and when fully upright, his height (length) exceeds 3 meters. Hercules can in one meal to eat up to 45 kilograms (100 lb) of meat, but his guards keep an eye on his diet and do not allow him to overdo it with weights. Valley of the Kings animal sanctuary in Wisconsin had a male liger named Nook who weighed around 550 kg (1,213 lb), and died in 2007, at 21 years old. Interestingly, when the father is lion and mother is tiger it's called Ligar and these are the largest cats in the world, but when the father is tiger and the mother is lion their descendants are among medium size cats. This is a really amazing example of the wild cats, because the mixing of the two races leading up to to create the largest cat in the world. 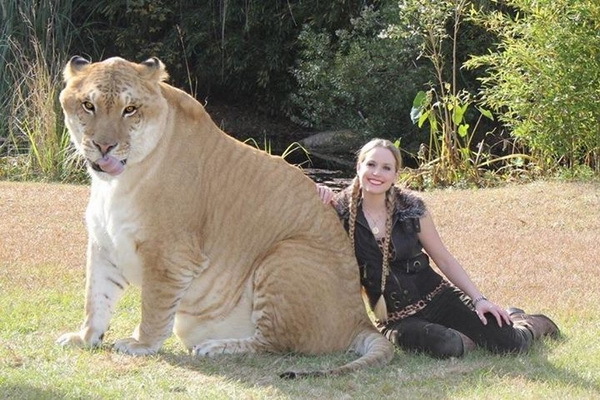 Scientists are trying to further multiply liger to create a new race of cats. Hercules guardians claim that if do he has blood of a lion and a tiger, he is actually a big cuddly cat who likes to play. His nickname is the gentle giant. We must admit that this cat inspires fear, and if you want to be sure of it, then look at the video clip.